Price: £3.90 (incl VAT) Sorry, this item is currently unavailable. Please consider purchasing Pollenase Chloraphenamine Maleate Tablets 4mg (30) instead. Numark Antihistamine Tablets - Chlorphenamine maleate 4mg. 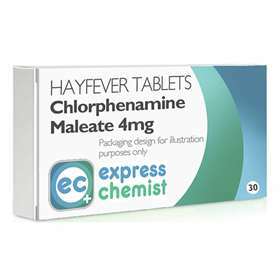 Please note: Packaging and Brands may vary but the active ingredient will remain the same, Chlorphenamine Maleate 4mg. To be swallowed with a drink of water. Adults, the elderly and children over 12 years - 1 tablet to be taken 3 to 4 times a day. Children aged 6 to 12 years - Half a tablet to be taken 3 to 4 times a day. CHLORPHENAMINE MALEATE, LACTOSE MONOHYDRATE, STARCH, MAGNESIUM STEARATE, ANSTEADS DISPERSED YELLLOW AND QUINOLINE YELLOW. DO NOT TAKE IF YOU ARE PREGNANT, NOT RECOMMENDED FOR CHILDREN UNDER 6 YEARS OF AGE. KEEP OUT OF THE REACH AND SIGHT OF CHILDREN. Product code: 1076132 Price: £3.90 (incl VAT) Sorry, this item is currently unavailable. Please consider purchasing Pollenase Chloraphenamine Maleate Tablets 4mg (30) instead.